For more information visit http://www.turpinrealtors.com/property/24057791/134-Mosle-Rd-Mendham-Twp-NJ-07945 North Branch Farm presents a tranquil natural setting apart from the everyday world. A pristine trout stream and captivating views of rolling New Jersey countryside are all part of this private landscape carefully tended for generations. Located in Mendham Township with land going right up against the Morris/Somerset county line, this delightful riverfront property is truly a rare offering in central New Jersey. Situated on one of the most desirable private roads in the Mendham-Bernardsville area with a Far Hills mailing address, the acreage spans both sides of a manicured gravel private entry road. To the east, tall trees frame distant views to the New Jersey Highlands. To the west is 3/8-mile of water frontage on arguably the finest private trout water in New Jersey, the headwaters of the North Branch of the Raritan River. This part of the river offers a mix of riffles and deep pools, where fly fishermen find brown and rainbow trout, and where for years multiple generations have enjoyed an environment where young and old alike find refuge from the busy world around them. There is also potential for an additional 2-3 miles of fishing rights on the stream. The three-bedroom, two full bath and two half bath custom home features a first-floor master bedroom with en-suite bath/shower and walk in closets. The second floor features a large bathroom, two large bedrooms, a studio and generous attic. In the large living room/dining room space, sliding glass doors open to a delightful terrace with wonderful views with no other house in sight. The home includes a full basement. A possible subdivision opportunity exists as part of this privately-situated property. One potential lot has the existing three-bedroom custom home surrounded by flowering dogwoods facing down the gentle slope toward the river, a garage and pole barn. Another site adjoins to the southwest, which includes the highest elevation for a potential house site, with views that extend out to the horizon. This lot is backed by preserved farmland. 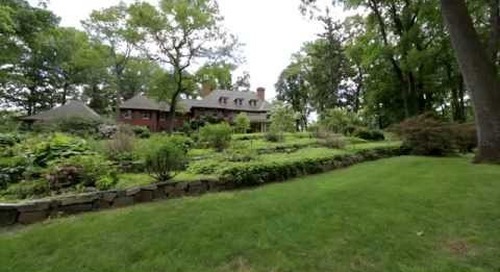 This rare riverfront property for sale in Mendham Township has a farmland assessment, which results in low property taxes. North Branch Farm is close to fine shopping and dining, Roxiticus Country Club, Somerset Hills Country Club, The Essex Hunt Club, and premier equestrian, golf, tennis and lake clubs. There is also easy access to various train stations, a network of interstate highways and Newark Liberty International Airport.